Dr. Richard Furman, MD, FACS, has over 30 years experience as a vascular surgeon. He is passionate about helping people prevent the problems that kill over half of all Americans. His unique ability to combine easy-to-follow advice with the latest medical research empowers men and women to: Achieve and maintain their ideal weight, Reduce their risk for life-threatening diseases, Make exercise a natural part of their lives, and Learn what foods to eat and what foods to avoid. Subscribe to Dr. Furman’s FREE Email Newsletter to Live Longer and Younger. 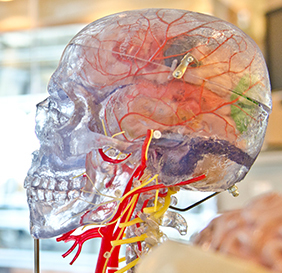 Do You Know The Hallmark Findings That Make the Diagnosis of Alzheimer’s? Alzheimer’s dementia is a complex entity. From a medical standpoint, we do not yet know what the initial step in the process is, or what exactly causes it to get worse. We do know there are two basic markers that make the diagnosis of Alzheimer’s disease. Those two markers within the brain of Alzheimer’s patients are two protein products called beta-amyloid and tau. In earlier years, to make the diagnosis, one had to perform an autopsy on someone with the symptoms, in order to see the beta-amyloid plaques and the tau tangles imbedded in certain parts of the brain. In more recent years, brain imaging devices have been developed which can detect the buildup of these products while the person is still alive. Now the early beta-amyloid plaques can be “seen” in people with no symptoms of Alzheimer’s – yet. This process has been found to begin more than twenty years prior to any symptoms. 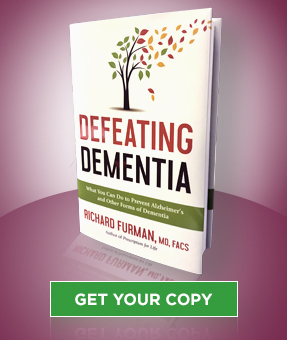 The authors of one of the journal articles I read said, “It is something everybody ought to know.” That simple phrase stimulated me to write Defeating Dementia – so everybody can know. The book is a review of the medical literature, and is written in a way everyone can understand what is happening in the brain as someone develops Alzheimer’s. It leads you through the stages from the beginning findings of the plaques until the dreaded day the person becomes dependent on someone else for the remainder of their life. We once accepted mental decline as “just a part of aging.” But today is different. A survey of people over fifty-five revealed that Alzheimer’s is feared more than any other disease. That includes heart attacks and strokes. It is even more dreaded than cancer. More people are becoming more aware of what they can to avoid ending up with the most dreaded disease. Today we’re learning that Alzheimer’s dementia can be stalled or perhaps even prevented by making better choices about the amount of exercise we do each day, the foods we eat and the foods we avoid, and how much we weigh. Studies are now available that show that certain groups of people end up with more beta amyloid deposits in their brain than certain other groups. The same studies are showing that the people who eat a certain way have a significantly less beta amyloid and tau tangles in their brain than individuals who eat differently. Also shown is that the ones who exercise have much less of the beta amyloid protein in specific parts of their brain. And lastly, the studies show that being overweight or obese play a substantial role in the development of Alzheimer’s. What we all want to do is control the lifestyles that place us in the “good” groups rather than the “bad”.